I just got the chance to try the beta release. Oh my god. This is fantastic. What an experience. 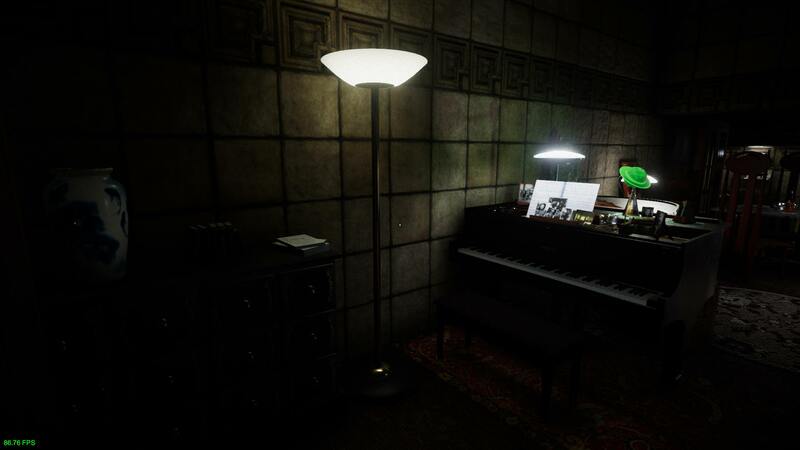 You can walk through the lamp next to the piano. I’m reporting some bugs, I tested the program only in FPS mode (not VR). •White stripes planes appearing and disappearing depending on the POV orientation, this occurs mostly in the floor entrance, living room, balcony and kitchen (bathroom, toilets an bedroom seem unaffected). The problem seems to be linked to volumetric lights as it disappear when VL are turned off. •The flashlight is off-centered, like your character is holding it in his right hand but not compensating the angle, that is especially problematic when standing close to the thing you’re trying to see. 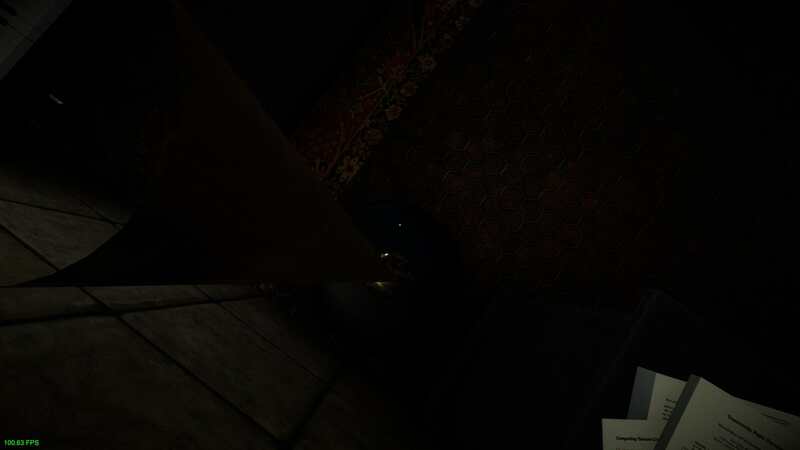 •The Pepsi bottles lying horizontal on the floor by the bar and by the desk don’t always catch the light of the flashlight, depending on the POV orientation. •From the balcony the lathes of the living room blinds are popping out of the left hand window frame. •From the balcony the other animated billboard, the one further away than the geisha, only shows horizontal and vertical white/red/green sometimes checkered patterns, not sure if it is supposed to be that way, but it looks like a bug to me. •It would be nice to be able to see the street at the same POV in the movie when Deckard is at the balcony, namely the living room windows. For this we should be able to open those windows (and there must be a guardrail or something) or at least be able to get the blinds out of the way. •In the movie the ceiling of the balcony seems entirely covered with flat tiles (not Ennis House tiles). Additional note: White stripes planes bug also disappear when depth of field is deactivated. Update: I’ve now installed it from Steam (Built 1.001) and tested it. I agree with Marc in regards to the street POV from the balcony matching the film. Also the outside rain is possibly too big and/or too white. Fabulous work! Hey, my bug reports are on the site, thank you for taking them into consideration Quentin! Have you heard of something called OVRDrop for SteamVR yet? It does cost a few bucks, but it’s very cool. It lets you move around and scale a screen in 3D space and tell it what window/monitor to render the content from. It’s based in SteamVR and overlays on to any game you play within the SteamVR ecosystem. So I just launched BR9732, sat down on Deckard’s couch, and put the screen aligned the best I could with the Esper screen…and streamed Blade Runner to that screen. I just watched Blade Runner IN Blade Runner in virtual reality. I can die a happy man. Thank you. Hi, thanks so much for such an awesome project. Been dying to try this on my Vive so I downloaded the Beta. Managed to get it working ok but my BUG is that I can not pick up the blaster at the menu screen. Controller appears ok and I can reveal the sub menu on the controller but not mater that I try, I can not grab the Blaster to launch the world. Anyway keep up the good work. Can’t wait to get in there. Une tuerie! Un grand travail pour les amateurs/ fans de l’univers! Merci Quentin! Si il faut des retours d’utilisateurs rift, here I am! Just want to thank you all guys! For the feedback, for the donations, … I wasn’t excepting this. I’ll thread all these remarks as soon as I can. First, thanks! Love the piano and esper machine. Hard copy output would be cool. Similar as noted above, controllers for me disappeared after Steam home button press, came back on second press, but could not teleport. Not sure about other actions. I have latest drivers and beta opt-in. Got glare on left side of right eye, second time, got full glare on left eye. Would not go away until restart. First of all, incredible work done here man! You deserve all the compliments. I tried it yesterday for the first time and was very impressed by the details and the moment I reached the balcony with such stunning view. I should mention that at first try I almost waited for 5 minutes looking to the front thinking it was loading, to find at last that the first “catch and shout” screen was standing at my right. I don’t know why, but it always appears in that position even if I’m perfectly aligned at SteamVR home. This misalignment also happens on stage. I should mention that I’m using an OSVR HDK2 if that could have some relation. Apart from that everything seems to be fine, although I missed some more interactivity with scene objects. Anyway, great work sir! This happens also on the consumer HTC Vive. mais c’est ma manière de contribuer. tant fasciné, un magnifique travail d’orfèvre! Bizarre pour ta 1080. En VR, j’ai de très bonnes performances avec une GTX 980, moyenne avec une 970. Essaie de t’assurer que rien d’autre ne tourne sur ta machine et de laisser la fenêtre Windows en 1280×720.